Prancer is a lab/hound mix who is around 3 years old. He came to us from a shelter where he was very scared in that kind of environment. He looks a lot like an Austrian Pincher too! He's a bit on the shy side and can be scared of new things - he takes some time to warm up and He will be a flight risk initially when he goes to a new home. He needs a family who is willing to be patient and go slow with him. He prefers women to men, and can jump a 4 ft fence if he wants to. His foster home has a 6 foot wood privacy fence and he does great with it. 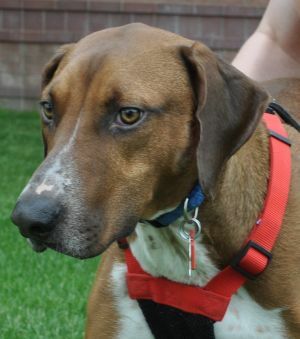 He is good with other dogs and he loves to play and doing well on his housetraining. He can hold it in the kennel for 6-7 hours. He's really a good boy who just needs the right home. 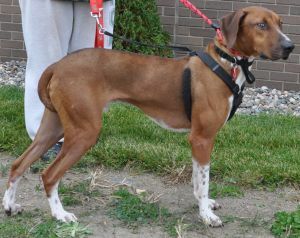 Foster to call: Katie - 605-695-5126 or krkallemeyn@hotmail.com text are preferred. 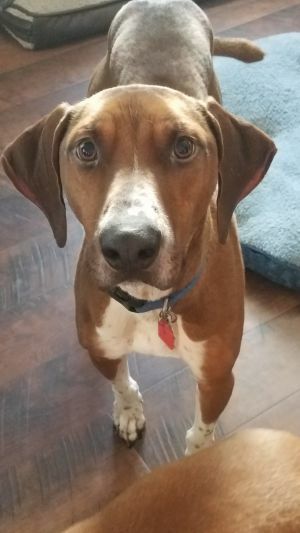 This dog will not be at our adoption event at the Woodbury PetSmart on Saturday from 11-2, so contact the foster to learn more. Our fosters do the best they can to provide all information about the animal's background and temperament while in foster care in their home. An adopters routine and home environment is likely going to be different than that in their foster home. Sometimes there is more that comes out about a dog's personality once they have been able to settle in a home and truly become comfortable. There are great articles out there written about the different stages a pet goes through after adoption, discussing transitions that happen at 3 days, 3 weeks, and 3 months. We highly recommend reading about this - it will help you understand the transition your new pet goes through..